I am in full on spring nesting mode. It can be blamed on the few days of temps in the low seventies and the buds sprouting on the trees. Even as I ride down the road there are red bud trees in full bloom and the cherry trees are starting to bloom. Ah, spring, my favorite time of year. Around here I have been removing dark and cozy fabrics for light and airy. Silver has been replaced with ironstone and greenery and flowers have been added here and there. I have made some simple changes in the great room since this is the most used and seen room.This is the room I see when I stand at the kitchen sink so it was time to lose the heavy darker pieces. You can refresh your memory here of how it looked before. I was using an old dark basket on this table as a tray, but now I am using this bamboo and rattan tray that I lucked up on and ordered from One Kings Lane. I hesitated to order this thinking it would be light weight and maybe not sturdy enough to hold heavy items. When it arrived I could not believe how heavy the box was when I picked it up. This is so nice and heavy and was just what I was wanting. I pulled this candle holder/vase that I have had a few years and first I stuck this textured candle in it. It was okay, but then I added these faux, yes faux, succulents in it for added color and softness. I really want to add tulips to this vase, but I just didn't feel like venturing out in the cold rainy weather the day I took these photos. I kept the books I used in the basket, but took off the jackets which I understand many designers say you should do. The ironstone lidded dish adds some more brightness and you will see how this works with the changes on the bookshelves and mantel in a future post. The easiest way to go from winter cozy to spring and summer light and airy is to change out the pillows. I have never used blue in here, but am loving these pale blue pillows that I had on hand in my pillow cover stash. I'm really hoping to have a linen or lighter colored slipcover made for this sofa some time in the future. I love the red, but also would love to have a lighter neutral in here. Ah, lighter and brighter feels good for the warmer days ahead. It's officially spring on March 20. I sure hope everyone gets spring like weather soon! 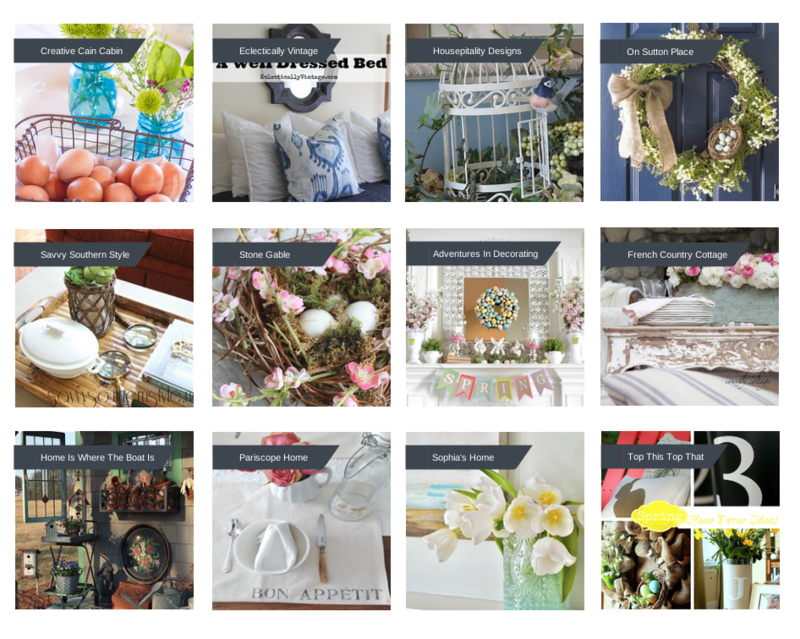 I am joining this group of girls today to bring some more spring ideas your way. Please click on these links to find some more spring ideas. The other six gals will be sharing their spring ideas tomorrow. I love the light blue pillows with the red!...Great, great tray...love the look and so glad that you are happy with it...it is a beauty...hmm, dust covers..yes, I have heard that...however, some of my books after taking off the covers are pretty plain..you are making me check out what is "under the covers'...Nice "partying" with you! Lucky you to be seeing signs of spring, we still have snow here. I have never seen faux succulents before, they are so cute and real looking. I am ready to change my slips to something lighter too, but it is still to early here. So I did like you a pillow change and a few items on the coffee table. It all looks lovely, Kim. So beautiful !!! I love all your ideas . Thanks for sharing . Hi Kim, I absolutely LOVE that light blue with the pheasant pillow on the sofa -- gorgeous combo!! I'm inspired to get some faux succulents, too. I'm the worst with real plants in the house, my kids say I am the kiss of death with them, lol. Have a great week. You lucked out on a great tray! I'm also really digging the succulents. I've never used them before but I'm seeing them a lot more lately. Faux ones are a good idea. The pale blue pillow goes great with your sofa...that's a color combo that greatly appeals to me! I love that tray! This is heaven here with all the Spring inspiration. I guess that's the positive about a horrible winter, Spring feels so good. The addition of blue is perfect. My goal in life is to have a pillow cover stash just like yours! Beautiful Kim! I am reading to change things up a bit as well. The warm weather has been such a nice change. I love that white ironstone dish you have... A perfect addition to your vignette! I really like your new tray from OKL, Kim ... and, the added pops of blue in your pretty sofa pillows look great! Come on Spring! The spring changes to the room are beautiful. Love the blue added in with pillows and that tray is awesome. 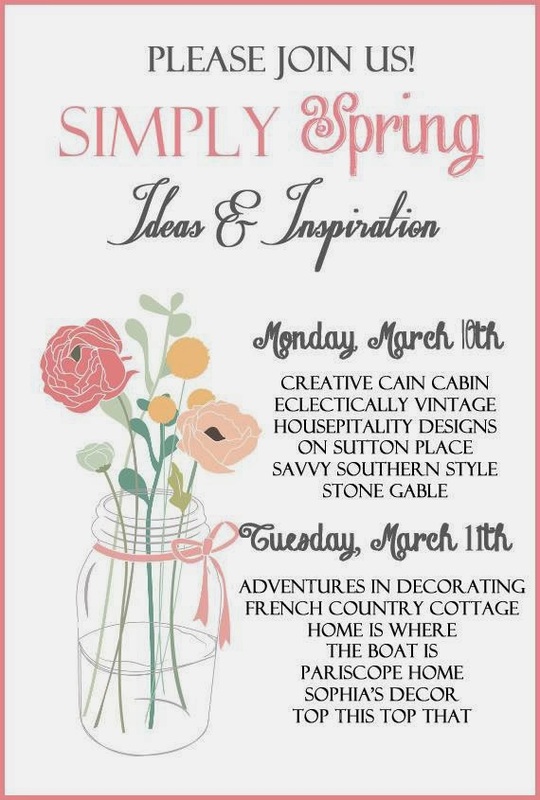 Love all the beautiful inspiration on the Simply Spring. Have a great start to the new week. I'm ready for spring! I finally cleared all the Mardi Gras things out and put them all away for next year. I took a deep breath this weekend, and am now ready to tackle birds nests, lambs and bunnies. no spring here yet so I love the thoughts of you seeing it, I love a touch of red, heck I love red! Your changs are lovely, I also love the term "Great room", so posh!! Kim, your Spring changes are fantastic! I love your tray and the pillow covers are perfect to lighten your room. You always provide us with so much inspiration! I enjoyed looking back at the changes in your great room too- amazing! On March 1st , I too traded out the silver for light bright white! Beautiful spring changes Kim. The luvly red bud trees and dogwood.... my favorites! They scream Springtime to me. You have a way of trading out one thing for another and giving everything a fresh new look! That tray is amazing! I like the light blue color that you added here and there to your room. So pretty! I don't blame you for not venturing out for tulips! Luckily, my hubby just bought me a few bouquets so I can stay nice and warm. Love your spring touches - I love trays! I must have around 20 throughout the house - but not a bamboo one as beautiful as this! You've got trees ready to bloom already?! We are at least 2 months behind, so I'll have to go visit all the links to get a taste of spring. I love your new bamboo tray and I'd love to cover my dark furniture with linen slips too. Kim, I'm in love with your new tray. What a beauty! Our weekend was wet and gloomy, but today we woke to blue skies and sunshine. I'm trying to put some spring color in the house now too. Feels good! Thanks for the inspiration. Your pillow stash must be a treasure trove. Loving the soft blues. I hope jack frost doesn't show his ugly face after the beautiful weather this past weekend. makes me want to forget all the projects just loaded up inside the house and go outside and play! Love your new tray Kim! Everything is beautiful as always...love now you style things :) I decorated up a tray on my coffee table for Spring too and even though there is snow on the ground outside (almost gone), it's nice to have that reminder that Spring will arrive! Your changes always look so good, Kim. It's that time of year when it feels so good to lighten up a bit. Kim what beautiful spring touches. LOVE that tray and the magnifying glasses you have are always so pretty. I can't wait to get in the house and decorate. It is moving fast now. Soo pretty Kim- I love your spring touches!! Love those pillows and the blue! Love the blue pillows. Just can't get started yet. But I know I will. I was struck by what a smart move it was to put the urn and florals in the fireplace! I've toyed (and seen) all sorts of summer fireplace decor, but this really does the trick. Great job and good eye. Everything looks wonderful right in tune for spring, I so love that tray, great eye. Love your new mix of pillows and your arrangement on the coffee table. It definitely looks like Spring! Pretty blue pillow covers! Don't you just love spring! Pretty vignette Kim...I LOVE that tray!! I always have the magnifying glass out, OLD age . Pretty. I love the looking glasses in the tray! Lighter and fresher feels great, doesn't it? Your room looks both! I love your new bamboo tray! These are the kind of changes I also like to make to welcome the new season, love the changes you have done, love to learn from you! I love all of your spring updates and am totally jealous of your new tray - love it. Looking good Kim. Love the hydrangeas in the fireplace. Looking pretty happy around there! "Blue-tiful" changes, Kim! I think the light blue looks very pretty on the red sofa. I'm with Debbie, above me, loving those hydrangeas in the fireplace. I bought a similar faux succulent at Pier One, and then saw some at Pottery Barn that I want to go back and get.